I have fallen in love with making octopus using the sous vide technique. It is so fool proof in its ability to make a super tender octopus, which you can just briefly sear afterwards to get those crispy edges. The results are fantastic. Better yet, the liquid broth that comes out is super flavorful and useful in a bunch of applications. You can use it as “stock” for making a flavorful farro “risotto” (like I did), cook it down with some wine or other herbs to make a flavorful jus, or make some kind of soup. The possibilities are endless and delicious. I got my octopus leg at New Deal Fish Market in Cambridge, which is a great, locally owned fish market that offers a lot of great seafood options. The Japanese in Boston love going there to get fish for sushi and sashimi. The preparation is pretty easy. Essentially, I am “poaching” the octopus in olive oil with salt and pepper at a low temperature. Cook at 77°C for at least three hours, but preferably five hours. I tried 3 hours thought it was OK, but I think 5 hours (which is what I have tried in the past) would have resulted in even more tender meat. Thomas Keller suggests 77°C for five hours. It looks really different cooked! To get the lovely char, grill the sous vide octopus over high heat briefly until charred. You can use a grill pan or a real grill. One easy and super flavorful side dish you can make is a “risotto” using the octopus broth from the sous vide bag (yummmm . . . so flavorful!). 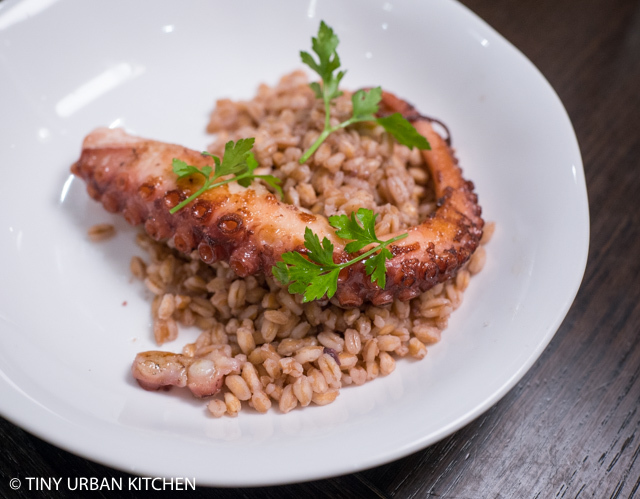 I used 10-minute quick cook farro from Trader Joe’s and cooked it with the octopus broth to make my own “farotto”. It was a simple yet elegant meal. Hello! I found your blog looking for Octopus recipes I too live in Mass I was looking at your pictures did you not blanch your octopus before sous vide? The final product looked great any insight would be most appreciated. Thank you for sharing the awesome recipe of making octopus! Very often I failed by overcooked it so the texture is hard. Hopefully by sous vide it will improve my cook making it super tender as you said. I’d love to try it coming weekend. Thanks again!